The completion is of great importance for the whole of Switzerland and the capital region. 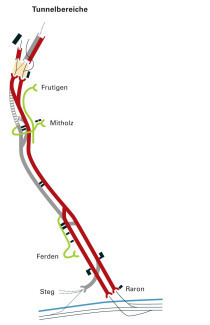 The Lötschberg Base Tunnel has to be included in the improvement stage for 2035. Any delay would lead to unnecessary extra costs. According to the railway company BLS, the Lötschberg Base Tunnel, which opened in 2007, is now operating at full capacity. The reasons for this are on the one hand the rapid growth of passenger and goods traffic and on the other hand its limited capacity due to the long single-track section. 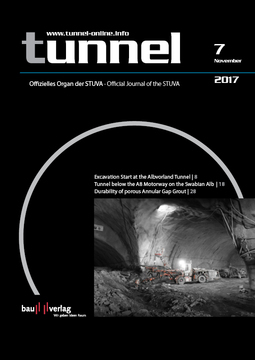 Of the total 34.6 km of the tunnel, only 14 km is open with two tracks. Part of the west bore is still under construction and another part has not yet been excavated. The single-track section of 21 km prevents the extension of passenger and goods traffic and leads to high operating costs. The completion of the tunnel, with two tracks is thus urgently necessary according to the BLS.